Our Annual Auction Evening takes place Saturday, April 20th, 2019. Join us for a night of paddle raising, sipping Etta-tinis, and connecting with friends of Etta Projects to support sustainable solutions to health, sanitation and water. Every year we empower Bolivian communities to transcend the limitations of poverty. People in 25 communities now have access to health care in their communities. Bolivians in 31 communities gaining access to clean drinking water every year. 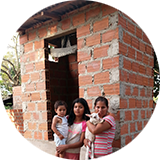 Families in 19 communities have clean sanitation systems.